Home / غير مصنف / Pokemon Let’s Go Eevee vs Pikachu exclusives: What are the differences? Pokemon Let’s Go Eevee vs Pikachu exclusives: What are the differences? Catching all 151 Pokemon to complete your Pokedex is tricky enough without having to worry about certain Pokemon not appearing in your game. Much like Pokemon Red and Pokemon Blue in 1996, Pokemon Let’s Go Eevee and Pikachu challenge trainers to trade creatures to beat the game. In order to complete Professor Oak’s challenge of cataloguing every single Pokemon in the Kanto region, friendly players need to get their hands on both versions of the gamer to catch them all. Players who bought Pokemon Red, for instance, had to rely on a friend with Pokemon Blue to get their hands on an Ekans, Oddish, Mankey and Growlithe. Pokemon Blue players, on the other hand, could not catch Sandshrews, Bellsprouts, Meowths, Pincers and Vulpixes. Nintendo, with its critically acclaimed remake of Pokemon Yellow on the Nintendo Switch, has once again reinforced the concept to foster co-op friendly gameplay and encourage people to buy both versions of the game. 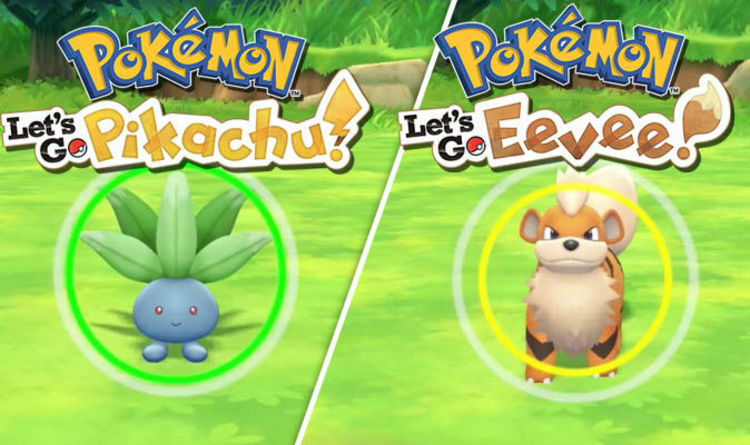 Pokemon Let’s Go Pikachu and Eevee offers a total of 153 Pokemon to catch across Kanto and veteran Pokemon players will be glad to note Nintendo’s brilliant nod to the original games. The exclusive Pokemon available across the new titles are a mirror match of Pokemon Red and Pokemon Blue, meaning the exclusives are identical to the parent games. But in case you missed out on the original games or have simply forgotten what those were here is a handy list of the exclusive pocket monsters. Once you complete your Pokedex, minus the 12 exclusive Pokemon not available to you, you will need to grab a good friend with the other game to trade. Read on below to find out how to trade Pokemon in Pokemon Let’s Go. Trading Pokemon in the halcyon days of the Gameboy Colour required at least one player to own a Link Cable to physically connect the two consoles. These days, however, thanks to the power of the internet, the only thing players need is a good Wi-Fi connection and someone to trade with. 3. Tap on “Nearby Player” for local trading and battling. 4. Select “Trade” and create a three-character code which your friend will have to enter on their Nintendo Switch console. These codes will be created from 10 different Pokemon sprites and will make sure you are trading or batting with the right person. 5. Select the Pokemon you want to trade by picking them out in your Pokemon Box. 6. Once you both select your trade offers, you will have to agree to the trade or cancel it. Follow the exact same steps for trading with people across the globe but select “Faraway Player” rather than “Nearby Player”.